Weekly Fitness Challenge: When work or family life take priority over personal fitness goals, it’s time to get creative with simple exercises that slide seamlessly into your day. The best reasons for taking the stairs are that it’s a simple exercise that strengthens the biggest muscles in our legs, you don’t need any fancy equipment or a gym membership, and it helps us get in better shape for any sport we play, including the game of love. It’s really as simple as taking the stairs instead of the elevator or escalator. Try the ‘3 Flights’ rule: If it’s 3 flights of stairs or less, take them. When you’re in the mall and have the side-by-side option of stairs or the escalator, well… you know what to do. 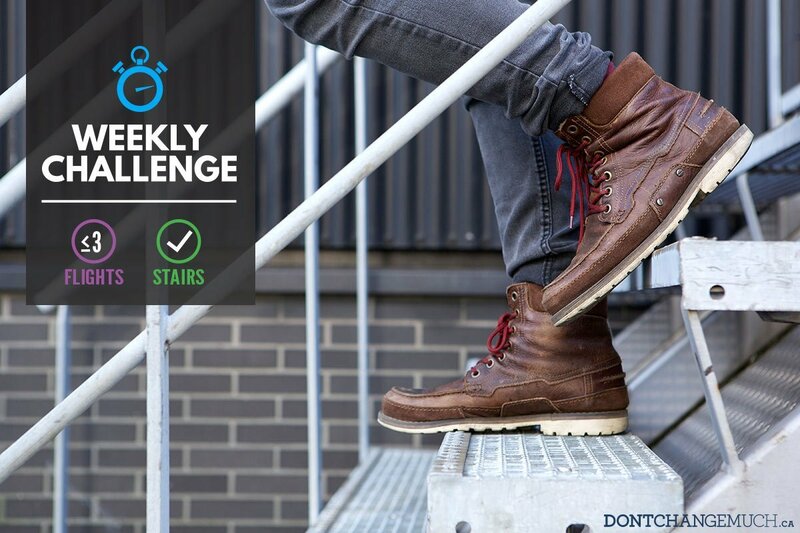 For guys, stair climbing burns around 10 calories per minute, so if a climb takes five minutes, and you make the climb twice a day, you can burn 100 calories and slide a 10-minute workout seamlessly into your day. Do the calculations: 100 calories a day x 7 days a week x 365 days year = you could lose 10.4lbs in 1 year, just by taking the stairs. For added motivation, branch out from your usual staircase and climb up a historic monument, or up a hill where a scenic view is your reward. If you really want to go for it, slip on some headphones and cue up “Eye of the Tiger” to do it Rocky style! Check out our first installment of the Weekly Fitness Challenge if you haven’t already — the Wall Squat — and remember: small changes amount to big health benefits over time.